Located in North Scottsdale, we are offering a peaceful, tropical oasis for our guests. Our comfortable single level 1,030 sq. ft. private Guest Suite has a separate entrance that does not require our guests to go through our own living space. Our house has a duplex setup providing complete privacy for our guests. Its location is ideal, being a 4-minute drive to TPC Scottsdale Golf Club and walking distance to Kierland shopping and dining. The Guest Suite has 2 bedrooms; one with a queen bed and sitting area, the other is a cheerful room with 2 twin beds. Both bedrooms have walk-in closets. It includes a bathroom with 2 sinks and a Jacuzzi tub with shower, a living room, a dining room with a buffet equipped with dishes and silverware, a small refrigerator/freezer, a microwave, and a Keurig for coffee or tea (no kitchen available). In addition, there's access to our back yard with a pool and propane grill (the pool is heated only by the sun; its temperature is dependent on the weather; best swimming weather is April thru September). Wireless internet access, Netflix, and cable TV are available at no additional charge. Enjoy the Arizona sunshine in our private back yard! Truly a resort lifestyle. Both Dan and Terry grew up in the Seattle area. They met at Bellevue High School where they graduated together in 1972, and were married 45 years ago. Dan worked as a mechanic and manufacturing engineer for Boeing for over 13 years before moving to Scottsdale 24 years ago. He finished his career as a Technical Writer and is now retired from Honeywell in order to have free time to write books and take mission trips to India. Terry is currently a respiratory therapist in an adult ICU for a major Phoenix hospital. We both love to share our home in Scottsdale and meet new friends! 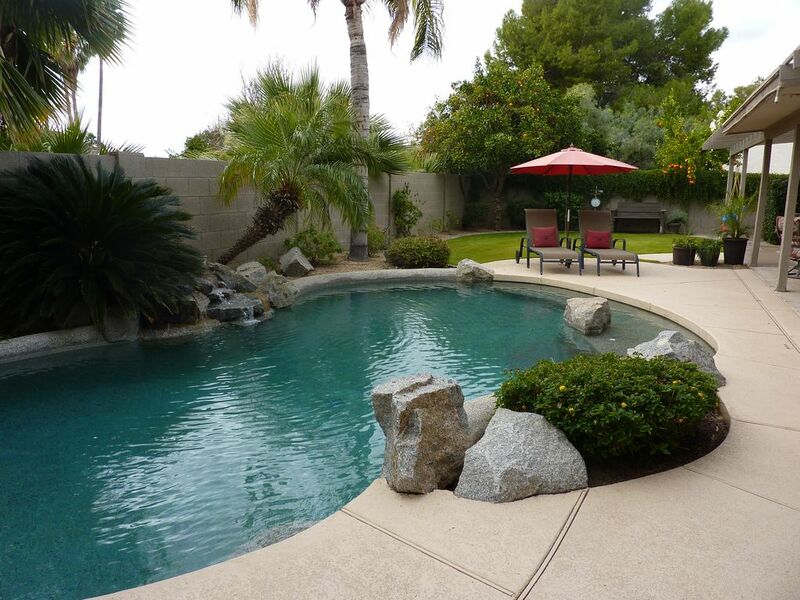 We fell in love with North Scottsdale and bought this home because of its great location. The house is in a quiet residential neighborhood on a quiet cul-de-sac but still close to stores, restaurants, golf courses, hiking trails, and major freeways. You can see beautiful sunrises over the mountains just east of us if you are early risers. The backyard is a tropical oasis in the Arizona desert. The pool is surrounded by lush plants and has a soothing water fall. Once you sit back in our comfy chairs you won't want to leave! toilet, shower, jetted tub, Large bathroom has double sinks. The guest suite bathroom is located in the hall between the two bedrooms. We are walking distance from The Kierland and Scottsdale Quarter shopping. There is also a free Trolley to Old Scottsdale. Mountain view from our front yard. Pre-arranged laundry facility available to guests staying more than 3 days. Weights and treadmill in one guest bedroom. With couch, love seat, and a flat screened cable television. Small refrigerator in the dining area. Small microwave in the dining area. Small toaster is available upon request. Dishes and silverware available in the dining room buffet. Dining area is included in the Guest Suite for you to use 24 hours a day; includes fridge/freezer, microwave and Keurig coffee maker. A DVD player is available. A few games are included. Patio off of queen bedroom. Also a covered patio in back yard has comfy sitting area as well as a table with chairs. The open patio is furnished with two lounges for sun bathing. Blocks from Westin-Kierland Golf Course; 2 miles from Scottsdale TPC and W.M. Phoenix Open. Heated only by the sun; not warm enough to swim in during the winter months. Includes waterfall feature. Enjoy a day of pampering at the Westin Resort and Spa or the Scottsdale Princess Resort and Willow Stream Spa which are both near by. Thank you for staying in our guest suite! Thanks Jim. Such a pleasure meeting your nice family. Hope to see you again! This is the second year in a row we've stayed in Dan and Terry's guest suite and it was absolutely perfect once again. They're two for two in our book. They have two nice sized bedrooms and very comfortable beds. The living room area was perfect for our size and needs. One of our favorite things to do is sit outside in the back yard by the pool. You can either choose to get some sun or sit under the umbrella and relax with coffee/book. The owners have lived in Phoenix for years, so if you need recommendations of places to go/things to check out they won't let you down. They definitely have a personalized approach which is second to none. We can't wait to visit again in 2020 for spring training. Thank you Dan and Terry! Very clean, roomy and comfortable home conveniently located in North Scottsdale. Owner is readily available and helpful. Note in the listing that there is no kitchen. There is a small refrigerator but not suitable for dining in. "The Guest Suite has 2 bedrooms; one with a queen bed and sitting area, the other is a cheerful room with 2 twin beds. Both bedrooms have walk-in closets. It includes a bathroom with 2 sinks and a Jacuzzi tub with shower, a living room, a dining room with a buffet equipped with dishes and silverware, a small refrigerator/freezer, a microwave, and a Keurig for coffee or tea (no kitchen available)." Charming 2 bedroom 1 bath suite in owners house worked for our family. While I could have used an easier way to wash dishes everything else we needed was there. (It was my fault not reading the details that there was not a full kitchen and house is a duplex with owners onsite) Though the owners are living in the other half of the house, we still felt a good deal of privacy with the setup. The home was exceptionally clean and comfortable. The kids LOVED all the toys & games along with the big jetted tub. Dan was a wonderful host to us. Thank you for your nice review Renea! We wish we could offer our guests a full kitchen, but since it's not possible, we've tried to make this clear in our property description. Thanks for your honest feedback. And I'm thrilled that your children had a good time, especially with the toys and games! Closest major cross streets are Scottsdale Rd. and Frank Lloyd Wright Blvd.